What Doctrine Are You Preaching & Teaching? Anyone can say the words, “I am,” but that does not mean that he is claiming to be God. Someone could say, “I am over here,” but that is not claiming they have a divine name. Likewise, someone could say, “I am hungry” or “I am sick.” Neither example is claiming divinity because of the use of the words, “I am” because the context clearly shows us that is not what is occurring. The context of the passage (John 8:58), for which Jesus was responding, indicates that he was speaking about his existence, not his name, which is in reference to the words “Before Abraham.” In addition, the statement would be meaningless if we were to use the phrase “I am” verbatim as it is written and claim it to be a name; it’s like saying “Before Abraham was, Tom,” the sentence structure is left incomplete. (See: Before Abraham Was I Am – John 8:58). 2Ch7:14 If my people, which are called by my name, shall humble themselves, and pray, and seek my face, and turn from their wicked ways; then will I hear from heaven, and will forgive their sin, and will heal their land. Upon whom my name is called (Acts 15:17), or “who are regarded as my people,” is an Aramaic mode of saying “who are called by my name.” The expression is so translated Jas 2:7 (Deut 28:10). “My people that are called by My name.” All men are His creatures, only a select and peculiar inheritance that bears His name and are in covenant with Him are called His people (Eze 16:8; Psa 4:3; Isa 43:21; Isa 63:18; Acts 15:14). To be called by His name notes to be His adopted children. (1) By visible profession or sacramental separation from the world, as the whole nation of the Jews are called His people (Exo 19:5; Deut 4:7). (2) By spiritual sanctification and internal dispositions (John 17:6; Gal 6:16; Rom 2:29, 9:8; Php 3:3). Before we begin, discussing Isaiah 9:6, there are a few Bible basics that should be set forth. In the old Jewish culture, people, places and things were often given “Godly” names (or titles). This has created problems for many of us who are Christians, especially those who attempt to apply the deity of God to that of Jesus Christ. Psalm 82:6 “I said, You are “gods“; you are all sons of the Most High.”; “gods” here in Hebrew is “Elohim”, which is plural of “EL”. It is the same exact thing as “EL” used for Jesus in Isaiah 9:6, since “gods” is a combination of several “EL”s. Note: As shown here, for someone to be called “god” or “God” in the Bible wouldn’t make him GOD Almighty Himself, (the LORD or Jehovah). You should already be aware of the English capitalizing and lowering of the letter “g” in “God” within the KJV and various other translated Bible versions. This capitalization manipulation can cause confusion to those who are unaware that there is no difference in meaning of the word “god” and “God”, it is the same word and has the exact same meaning! Sam is the shortened form of Samuel. 2- Isaiah or Jesaiah, which is short for “Jesa Yahweh”; it means “Jehovah has saved “. 3- Joshua, which is short for “Josh Yahweh”; it means “Yahweh Saves”. 4- Gedaliah is short for “Gedal Yahweh”; it means “Jehovah is Great”. Isaiah 9:6 – For unto us a child is born, unto us a son is given: and the government shall be upon his shoulder: and his name shall be called Wonderful, Counselor, The Mighty God, The everlasting Father, The Prince of Peace. Isaiah 9:7 –Of the increase of his government and peace there shall be no end, upon the throne of David, and upon his kingdom, to order it, and to establish it with judgment and with justice from henceforth even for ever. The zeal of the LORD (H3068) of hosts will perform this. First, it is important to recognize (using the King James Version) that when Isaiah 9:6 says his name will be called Wonderful, Counselor, Mighty God, Everlasting Father, etc., it is telling us about the characteristics of the Messiah. There is no Biblical record bearing witness that Jesus was ever called by these names (titles). The text speaks of a name (singular), yet has four things (characteristics) revealed in the name. Again, this shows us that it is the characteristics of the then-coming Messiah, not his literal name. The nation of Israel in the Old Testament knew nothing of an “incarnation.” For the Jewish people, their Messiah was going to be a man (John 4:25-26, 8:40, Acts 2:22, Rom 5:15) who would be anointed by God (Luke 4:18, Acts 4:27, 10:38, Heb 1:9). The Messiah would be born, and go through childhood, grow up to be a great ruler, the government will be on his shoulders and he would reign on David’s throne (v. 7). Jesus, being “the Son of David” (David’s flesh and blood ancestor) met this part of that criteria (Matthew 9:27, John 7:42, Rom 1:3, 2Ti 2:8, Rev 22:16). When accrediting the fulfillment of any prophecy pertaining to anyone (Jesus in this case) it is important that we first verify that the prophecy was actually fulfilled. 1) The very first stipulation presented is that he shall carry the government upon his shoulders (verse 7). Jesus never formed or ruled a government from the throne of David, which was/is to be given him from God (not then and certainly not today). Isaiah 9:7 – Of the increase of his government and peace there shall be no end, upon the throne of David, and upon his kingdom, to order it, and to establish it with judgment and with justice from henceforth even for ever. The zeal of the Lord [Jehovah-God] of hosts will perform this. 2) The last major verifiable stipulation, there is to be world peace forever (no end), which certainly does not exist at this time. We could argue (without having any evidence of course) whether or not Jesus was ever called by these names during his lifetime (unlikely since it is not recorded in the Bible as having occurred), however and without question most churches today (Trinitarians as well as Oneness) in our attempt to prove that Jesus is God we often like to cite Isaiah 9:6 as proof. Based on what can be proven with the word of God, this has been applied incorrectly. We know that many Hebrew words (in the Old Testament) often have multiple definitions. Biblical harmony is dependent on applying the correct meaning of the word intended which determines if our interpretation or translation of a scripture is correct and thus in harmony with other scriptures. We must first understand that this transliterated phrase “Mighty God” can be transliterated in several different ways and each one be technically permissible, yet only one would be correct and best harmonize with every other scripture that would be related. The English word God, in this instance (Isaiah 9:6) is the Hebrew word “El” (Strong’s Concordance H410) which signifies strong or powerful, and is applicable to any powerful being and especially so to the most powerful–the Almighty Jehovah. One clear example is the word translated “God” in Isaiah 9:6 is also translated “mighty” in Psalm 82:1, referring to the saints. The Trinitarian bias of most translators can be clearly seen by comparing Isaiah 9:6 (el = “God”) with Psalm 82:1 (el = “mighty”) both are referenced as H410 (Strongs Concordance). If calling the Messiah “el” (the original Hebrew) made him God, then the saints would be God also. Isaiah is speaking of God’s Messiah and calling him a mighty ruler, which of course he will be. One possible transliteration of the words used by King James “Mighty God” could be –He shall be mighty powerful. And so he is, for to him the Father has given all power in earth and heaven–(Matthew 28:18, John 17:2, Eph 1:20-22, Php 2:9-10, Col 2:10, 1Peter 3:22). “He is Lord of all”–next to the Father for “The head of Christ is God.” (1 Corinthians 11:3.) They are one in mind, purpose, etc., because Jesus gave up his own will and took the Father’s (John 5:30) just as we must give up our will, mind, spirit and receive the Father’s if we would be made heirs of God, joint-heirs with Jesus Christ our Lord. This phrase “Everlasting Father” can be understood in several ways. Of the three only one is the most correct and harmoniously supported by scripture. 1.) Since the phrase “the Son of God” is not synonymous with the phrase “God the Father,” the term “Everlasting Father,” if we said it applied to Jesus, would not be synonymous with “Heavenly Father” and this is based on several Biblical facts (Matthew 16:17; Revelation 3:21) & (Acts 7:55-56; Acts 17:30-31; Romans 8:34; Ephesians 1:20; Hebrews 9:24, 10:12). “Father” (Strong’s H1) can also mean “ruler or chief of a group of people,” which was used in both biblical (Numbers 25:15; Isaiah 22:21 and Job 29:16) and non-biblical literature. As Americans we also use it in this manner, often George Washington is called “the father of our country,” but it certainly is not saying he sired all Americans! It is a figurative term that describes a great leader. A similar contrast, which is easier to see, is between Abraham and God. Abraham is called our father (Romans 4:12) and the father of us all (Romans 4:16), yet no one would think Abraham is our Heavenly Father, who is called our father (Col. 1:2; etc.) and the father of all (Eph. 4:6). Each is called father with similar titles, yet they are clearly not the same person. 2.) The term “Everlasting Father” can also signify cause or authorship of being or life giver. So Isaiah’s declaration could possibly mean that Jesus (the child) will be known as an author of life–or life giver to someone. When we inquire to whom will he give life? Paul answers “As in Adam all die so in Christ shall all be made alive.” Holding this point of view would then teach us that Christ was to become the Father (or author of life) for the entire human race. Next we might ask what kind of life or nature will Christ give the human race? And the answer is, Christians will be given a perfect nature or glorified body as that of Christ and hence an eternal life (Philippians 3:20-21; 1 Corinthians 15:44; 1 Peter 1:3-5) just what we lost through Adam’s transgression. It was after Adam’s disobedience to God that Adam was prevented access to the Tree of Life, thus he never obtained such a body (eternal life Genesis 3:22) instead his body became “corrupt” (or unworthy) because it had committed a transgression (sin). “As through one [person’s] offense [Adam] this sentence came on all men to condemnation [condemning all to death (a loss of eternal life)] so also, through one [person’s] righteous act [Christ] all men received the justification to obtain or have “eternal” life. That is, through the obedience of Christ the original “death” penalty (being permanent) is now to be removed, by Jesus death mankind’s debt was paid and all men shall have a right (opportunity) to obtain eternal life again. –and in so doing Jesus (future) could possibly be called or looked upon as the “Everlasting Father” (author of life). Technically, Adam could be considered the Father of humankind. Adam was the First biological father of all mankind. He was created that he might be the father (or life giver) to a race of human beings. But because of his disobedience he lost his own right to eternal life. He could only give to his posterity what he possessed–a dying nature–and consequently none of the human race ever attained perfect life. Thus, Adam failed to become in the technical sense an “Everlasting” father or life giver. Jesus was born after the nature of Adam as a human man and as such had to face the death of a corruptible human body. Jesus became the firstborn of a glorified or divine nature subsequent to his resurrection when God raised him incorruptible with a glorified body. As such Jesus became the Head of the Church (Ephesians 5:23) and the leader of the redeemed (Revelation 5:9). Jesus is called “Captain,” “Leader,” “Forerunner,” “Master,” “Head,” “Lord” but never was he called our Father. It is because Christ will accomplish this work of life-giving, in which Adam failed, that we could even possibly call Jesus the “Everlasting Father,” as Jesus now has obtained this everlasting life (Rev 1:18). Likewise, we have our founding fathers, the men who were instrumental in founding our country. We also use terms such as the Father of Soul (James Brown) to describe a man that was instrumental in founding a new genre in music, etc. When we look at these many uses it is easy to see how this phrase could possibly apply to Jesus as being the Father of the redeemed, as Jesus was the instrument God used to provide redemption for all mankind and through his obedience to the will of his Father (God) man was given the opportunity to be reborn, with the promises and grace available to those who have been redeemed. 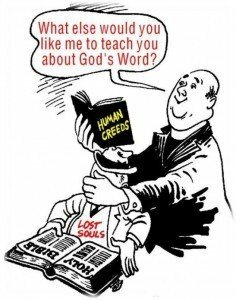 So let’ not get this Everlasting Father phrase twisted or distorted, it is God who is the Father of our Lord Jesus Christ and God who hath (or will) begotten us (1 Peter 1:3), not Christ. As God raised up Jesus to the Divine nature and likeness of God, then he, [God] will raise up us also by His Spirit (1Cor 6:14; 2Cor 4:14). Out of the numerous translated versions of the scriptures (KJV, NIV, AMP, NLV, etc.) there is one version (The Book Of Yahweh) (pg.536) that I believe probably best conveys Isaiah 9:6 correctly and fits most harmoniously. Acts 10:42 And he (Jesus) commanded us to preach unto the people, and to testify that it is he (Jesus) which was ordained of God to be the Judge of quick and dead. Acts 17:31 Because he (God) hath appointed a day, in the which he will judge the world in righteousness by that man (Jesus) whom he hath ordained; whereof he hath given assurance unto all men, in that he (God) hath raised him (Jesus) from the dead. Daniel 3:25 – Who Was The Son Of God? Was the fourth person in the fire an angel, a visible manifestation of God (theophany), or Jesus the Son of God? (Job 1:6) Now there was a day when the sons of God came to present themselves before the LORD, and Satan came also among them. (Job 2:1) Again there was a day when the sons of God came to present themselves before the LORD, and Satan came also among them to present himself before the LORD. (Job 38:7) When the morning stars sang together, and all the sons of God shouted for joy? A point of contention is that the King James Version translated “בר” as “Son” with a capital letter, which makes it seem as though the king was referring to Jesus Christ (Daniel 3:25 ). The King James Version of Daniel is the only version that says “Son of God”. This version tends to create confusion in understanding the reading of this text but this is easily remedied. In this instance, the King clearly refers to the fourth man as an angel. Therefore, one could argue strongly that the word “angel” and the phrase “Son of God” (even when spoken in the singular) was at times (in the O.T.) used interchangeably. King Nebuchadnezzar said “like unto” the Son of God in the KJV, not “was the Son of God”.